Description: 2003, A-style, flame maple back, sides, and neck, spruce top, full light sunburst finish, ebony fingerboard, headstock veneer and backstrap (striped), raised pickguard, and adjustable bridge, fully bound in grained ivoroid, gold hardware including custom engraved tailpiece cover, 1-1/8th inch nut width, pearl logo and small torch inlaid on headstock. 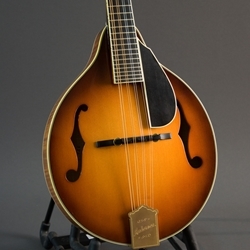 This is a fine mandolin built by Seattle master luthier Steven Andersen. In excellent condition, includes TKL hard case.